I installed it on my local machine to give it a quick test. I had it up and running quickly without any problems whatsoever. Many of the other Lifestreaming themes out there that get their functionality by being paired with a plugin that allows you to import services. Jason decided to build that feature directly into the theme. The only drawback to that is that he only supports 3 services out of the box which include Twitter, Flickr, and Delicious and the ability to add one more external RSS feed. This may be a limitation for people so it’s worthy of noting. 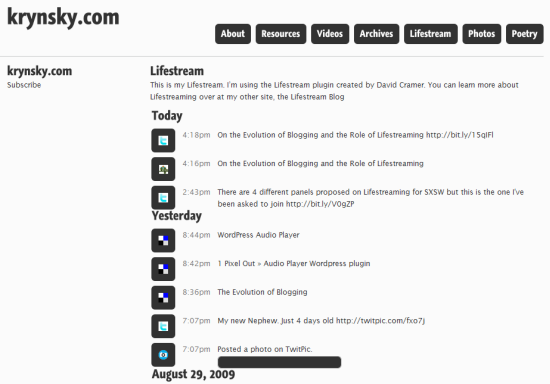 However I did happen to have the WordPress Lifestream plugin running for the site I was testing on and it worked and appeared nicely within this theme. I really like the clean minimal look of the theme as well as the typography used. But some may find it may be too clean because it doesn’t appear to support any sidebar widgets which is also worth pointing out. There are also some other differences in Jason’s original theme design for his site which I liked that didn’t make it into this version. He originally provided a profile legend with links to many additional social media services as part of the navigation. He also displayed an excerpt for the latest blog post at the top of the page. I’m not sure why he removed these but perhaps a new version will bring these features back. Speaking of new versions, he sent out a tweet showing a sneak peek of a new personal site refresh which appears to be using this theme’s framework coming soon. You can download the theme and even get a live demonstration of it on the site here. Thanks, Mark. As of now, it appears that StoryTlr would be a simpler and more flexible approach than using this theme – it works with your own domain, has multiple visual themes, imports myriad service feeds, supports widgets, and so on. 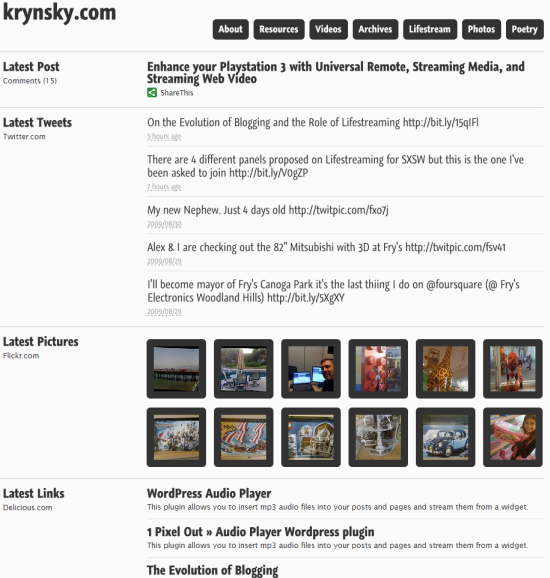 Mahendra, I really like Storytlr but don't think it's a fair comparison to a self-hosted WordPress blog. They each have their own set of pros and cons. With WordPress you have quite a bit more control and flexibility than using a hosted service. There can never be a comparison between a service like StoryTlr and a self-hosted WordPress blog. I was just opining that it would be an attractive choice for those seeking simplicity, flexibility, and don't want the hassles of maintaining their own WordPress. Hi Mark! Do you know if it's possible to use widgets in the sidebar with this template?